When you toss materials anywhere but the appropriate bin, it is considered dumping or littering, and it is illegal. When Santa Fe County and City residents do not want to pay to properly dispose of their trash, it ends up in the arroyo or open space, polluting the habitat for both animals and humans. Most of the materials that are found at illegal dump sites can be recycled or reused. Consider the reuse of your unwanted materials at a Donation Center, posting it on Craigslist, or having a garage sale. Items like common Recyclables, Electronics, Household Hazardous Waste (HHW), Bulky Metals and/or Appliances, that are not suited for reuse can be recycled for free or a small fee. “The Environmental Services Division offers a large-item pick-up service for items such as large appliances and furniture. Large Item Service Fee – $33.33 per visit. 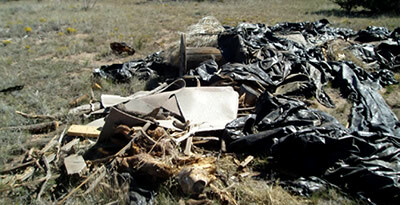 Call Environmental Services (505) 955-2200 to schedule collection. One customer per call and all items must originate from that customer’s household. Take your unwanted materials to BuRRT to have it disposed of properly.